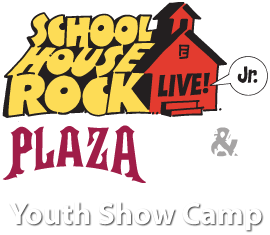 Plaza Theatre Company - School House Rock Live Jr.
A pop culture phenomenon comes to the Plaza Theatre Company stage presented by our Youth Summer Campers! The Emmy Award-winning 1970's Saturday morning cartoon series that taught history, grammar, math, science and politics through clever, tuneful songs is instructing a whole new generation to "Unpack Your Adjectives" and "Do The Circulations." Tom, a new school teacher nervous about his first day of teaching, tries to relax by watching TV when various characters come to life and show him how to win his students over with imagination and music, through beloved songs like "Just A Bill," "Lolly, Lolly, Lolly" and "Conjunction Junction." performed by students ages 8-12.